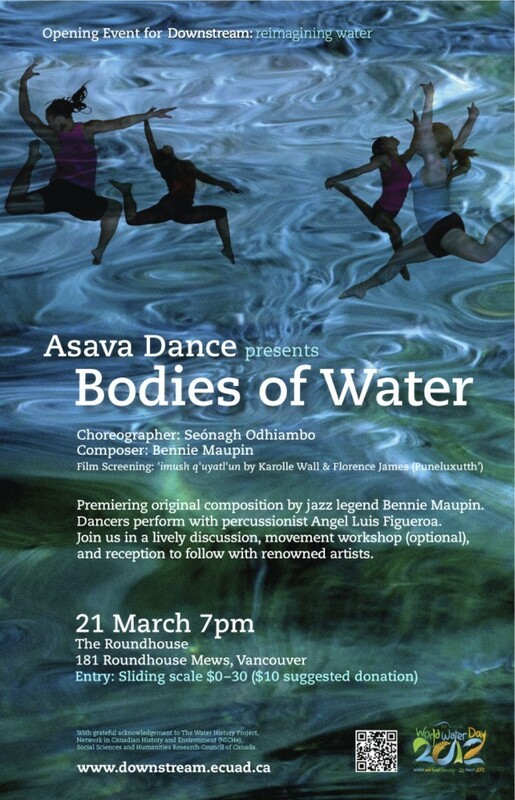 Asava Dance and Downstream: Reimagining Water held an incredible opening event for World Water Week at The Roundhouse, March 21st at 7pm. It was an evening of dance, creativity, music, and imagining. Former Vancouverite Seonagh Odhiambo, now a professor of dance at CSULA, and the Asava dancers offered a stunning performance with live music. The premiere of jazz legend Bennie Maupin’s original composition was performed live by world renowned percussionist Angel Luis Figueroa. The Bodies of Water project draws inspiration from movement and stories of people on diverse shores and across rivers. This brings awareness to the need for water among those who live without access to clean water. Karolle Wall and Florence James (Puneluxulth’) offer insight through a short film, ‘imush q’uyatl’un, that helped inspire some of the dance movement. Odhiambo then leads audience members in a movement workshop (optional) with her dancer-collaborators. The audience is invited to contribute stories about water to the creative process. Reception to follow with the artists. Asava Dance is a Los Angeles-based ensemble that has riveted audiences in Canada and the US for the last year. The company presents site specific works and dances for the concert stage. The Bodies of Water Project is reaching audiences from Toronto to Los Angeles. Canadian dance legend Elizabeth Langley called it “Dance that retains its humanity while thrilling us with its energy.” Canadian choreographer Seonagh Odhiambo, composer Bennie Maupin, percussionist Angel Luis Figueroa, and the dancers Bria Milan Cameron, Mariah Murray, Megan Ryan, and Kimberley Michelle Smith, give stunning performances and movement workshops. These events inspire important discussions that affect our communities. Dancers explore energy, flow and reflection around topics of social or environmental significance. The choreographer involves audiences in reflecting on meaning and contributing to the dance. Through select open rehearsals, audiences are invited to participate in a process of movement creation. With thanks to Kushala Yoga & Greene Goodies for sponsoring the tea service at the reception!